The Festival is a registered charity, run for the benefit of the community, not for profit. 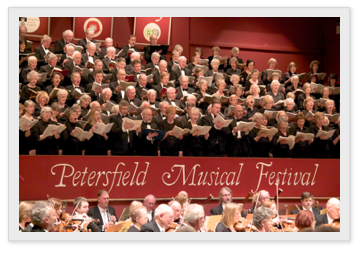 For more than a century, the Festival has promoted music-making in and around Petersfield, bringing together local singers and instrumentalists of all ages to share the platform with visiting musicians of national and international standing. The Festival takes place at the Petersfield Festival Hall, built for the purpose and officially opened in 1935. The origins of Petersfield Musical Festival lie in the inspirational effect of the Mary Wakefield Festival of Music at Kendal in 1897 on two sisters: Edith and Rosalind Craig Sellar. The history is recounted in Petersfield Music Makers by Marjorie Lunt and Mary Ray, published by the Petersfield Area Historical Society in 1986. The sisters hailed from Compton in West Sussex and their enthusiasm and drive to bring a similar event to Petersfield resulted in the first Festival taking place in Petersfield’s old Drill Hall in 1901, attracting six choirs, various individual and group competitions and a hall full of music lovers. Edith Craig Sellar was one of the conductors involved in the first performances, while her sister Rosalind took on the role of accompanist. The Petersfield WI joined the Festival competitions with a choir in 1902. Later, as Mrs Alexander Maitland, Rosalind conducted the Children’s Day choirs (in 1913-14 and 1921-23). Two years later, Rosalind found herself the centre of attention of a very different kind. She had met Neville Chamberlain, later Prime Minister but until then an unattached 34-year old bachelor who had studied science and mathematics, but who was also extremely keen on music and literature. As a result of losing his mother (she had died in childbirth when he was six) and having a strained relationship with his father, he developed a close bond with his sisters Ida and Hilda. Among Hilda’s friends was Rosalind Craig Sellar, a professional singer. In 1911 at the age of 41, and despite having been expected to remain a bachelor, Chamberlain married Anne de Vere Cole, “an ideal wife for an aspiring politician” and “wonderfully good in a crisis”. It proved a very happy marriage, blessed first with a daughter and then a son. Rosalind had already married Alexander Maitland in 1906, whilst her sister Edith became Mrs Stewart Gemmell the same year.